Major health concerns aside, I’m fairly certain I would be happy to live on the following foods and beverages alone: Pretzels, ice cream and coffee. The pretzels take care of the salty cravings, while the ice cream takes care of the sweet. And I really don’t think I could make it long without coffee. Actually, YOU don’t want to see me make it long without coffee. It’s just not good for anyone. 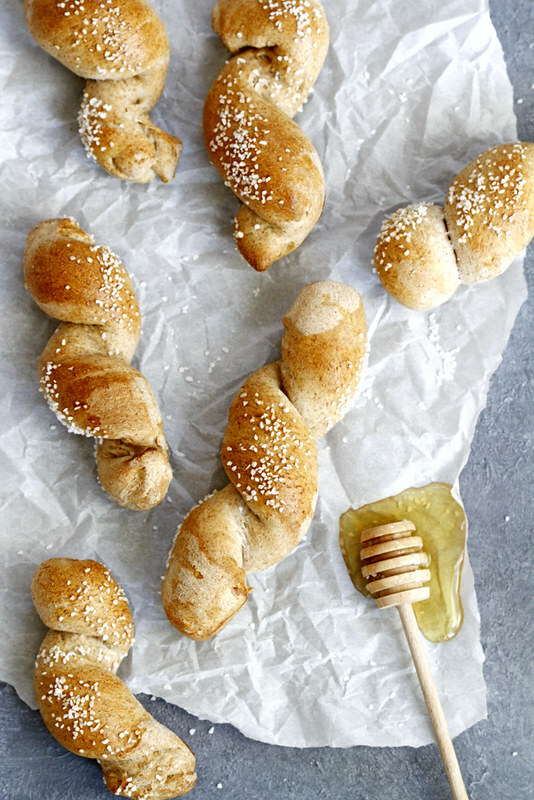 These honey wheat pretzel twists, however, are not only good for everyone but they are both salty AND sweet. And they take only 40 minutes to make. So actually, I probably could just live on these pretzels alone. I’m not sure they even make these anymore, but does anyone remember/still eat those honey wheat braided pretzels? They were hard pretzels shaped like small twists, and I kid you not when I say I ate them EVERY SINGLE DAY in college. I loved them. I still do, though I haven’t eaten them in forever (because college was, like, a long time ago now, you guys). Those little bites of pretzel heaven were the inspiration for this recipe, except that I also was really craving soft pretzels. So I combined the two ideas into one, and the results were spectacular: soft, chewy, sweet from the honey, salty from the salt topping, with a little bit of virtue from the whole wheat flour, all done in less than an hour. I practically devoured one straight from the oven ← don’t really recommend lest you want to burn the roof of your mouth. Maybe wait like two minutes. A few notes: Don’t try to swap all of the all-purpose flour for more whole wheat flour. The ratio of all-purpose to whole wheat in this recipe is just about the maximum amount of whole wheat flour you can add before the dough will become tough and dry. It also does take a bit of patience and time to roll out the dough into ropes, and if the dough seems to fight you as you try to roll it out, let it sit for a few minutes so the gluten can relax, then try again. Also, your twists don’t need to be perfect (as you can see, mine are a little “rustic”) but when you shape them, be sure to pinch the seams at the edges of each twist to help them maintain their shape as best as possible. But if they don’t, they will still taste amazing, so don’t worry about it too much. Finally, keep these on hand as a snack or serve them up as a healthier game day appetizer, with extra honey (or honey mustard, or nut butter!) for dipping. You’ll be surprised how quickly they disappear (or maybe you won’t, once you give them a try yourself). But seriously: these, plus coffee? I’m set. Heat oven to 425 degrees F. Spray 2 baking sheets with cooking spray. 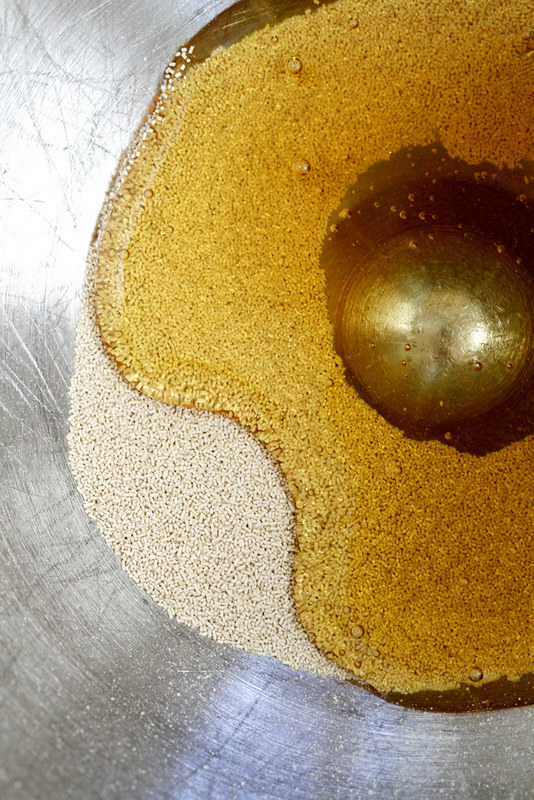 In a large bowl or bowl of a stand mixer, stir yeast, honey and warm water until combined. Let sit 5 to 10 minutes until mixture is foamy. Meanwhile, in a large bowl, whisk together flours and salt until combined. Add to yeast mixture (once foamy) along with oil. 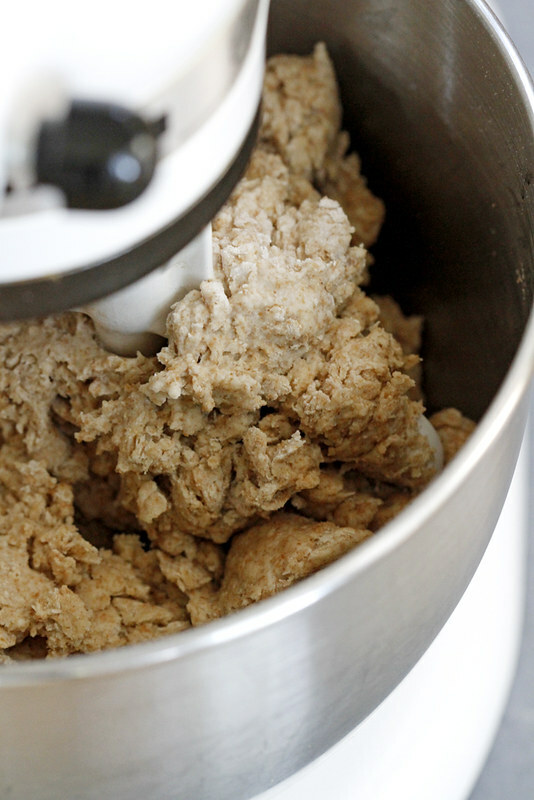 Stir, either with a wooden spoon or paddle attachment of stand mixer, just until a dough forms. 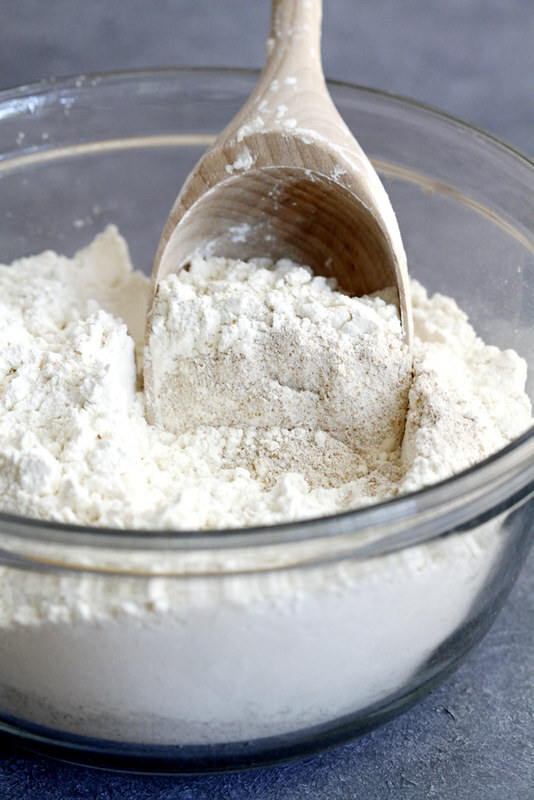 On a lightly floured surface, knead dough by hand 5 minutes until smooth and pliable, OR, swap paddle attachment for dough hook attachment on stand mixer and knead dough on low speed 3 minutes until smooth and pliable. Divide dough in half. Roll each half into a long rope about 1 inch thick. Divide each rope into 8 pieces. Twist each piece of dough a few times, pinching edges to seal. Space twists 2 inches apart on prepared baking sheets. Brush each twist generously with egg wash, then sprinkle with pretzel salt. Bake 20 minutes until pretzels are golden brown and baked through. Wow, only 40 minutes? That’s so fast for something so wonderful! How can I not make them now!!! And we are like twins sometimes because I think those would be the three things I would live off of for the rest of my life too!!! LOVE anything honey wheat! Music to my ears, I mean… tastebuds! Yes to pretzels, ice cream, and coffee. You just get me! I am DEFINITELY going to be getting my pretzel twist on during an upcoming game day. I hate football, but I can get through it with some healthy-honey-twisted magic. AKA: THESE BABIES. Love! Pinned! Wow. I ALSO love those little hard pretzel twists! But I like the sound of a soft version even better. I still haven’t made homemade pretzels. OR bagels. Will you just come to my house and force me to do it?! I was excited to read this recipe cause I too love pretzels. I was surprised the recipe didn’t have a step of boiling them for a a minute or so?? So I went to an Oktoberfest in Colorado a few weekends ago with my pretzel-loving friends and was soooo jelly at all the pretzel eating that was happening. 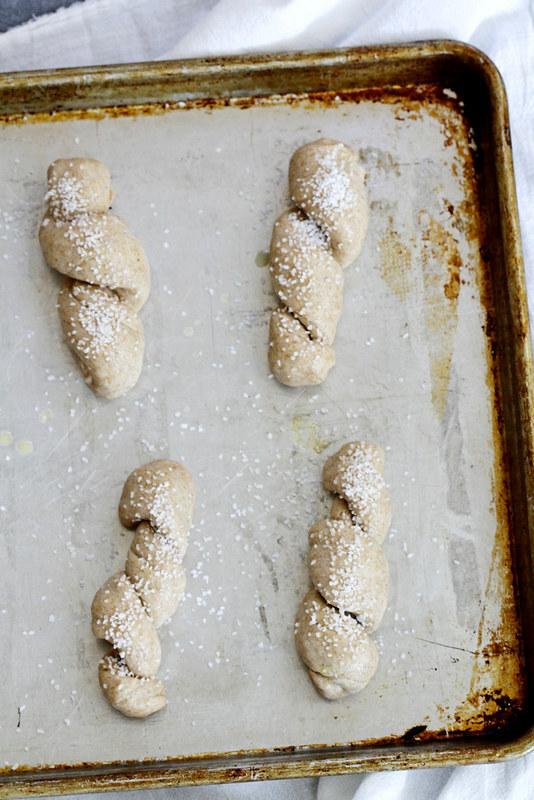 Now I’m itching to make these pretzel twists using BRM’s GF AP flour….for the flipping win!! I’m having a major moment with soft pretzels right now, I can’t get enough. I just made a batch the other day, however, they were not healthy in the slightest, so these pretties would do me good while simultaneously fulfilling my soft pretzel obsession. I want them now! Can you believe Sean is “meh” about pretzels (weirdo)? All varieties?! More for me, I guess..and at least Casper loves them, too! 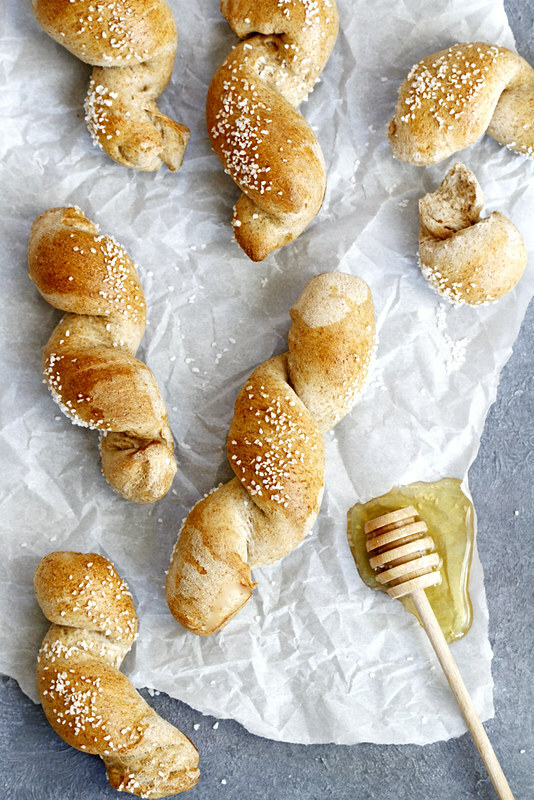 These pretzel twists are so dreamy!! Love, love, love the flavour! Those honey wheat pretzels got me through lots of late night studying in college (and I don’t want to think about the fact that college years are starting to be a long time ago!)! I cannot wait to give these a try! Be still my heart, these twists are everything! Hello there! Let’s be friends please. Thank you very much! Wow, these pretzel twists look amazing! I love it how you used wholewheat flour, I think it has a lovely taste. 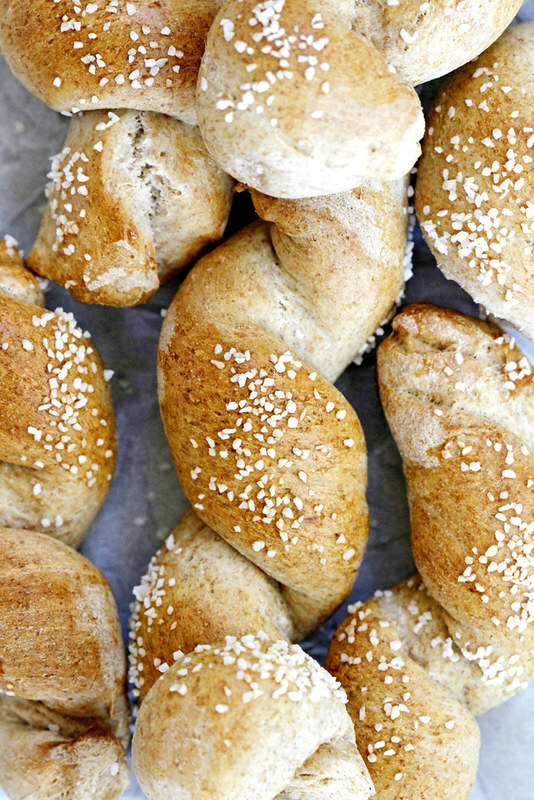 Also, homemade pretzels in 40 minutes?! That sounds too good to be true, pinned! Yup, there’s no living without my coffee fix. Now that I’ve laid eyes on these gorgeous sweet and salty twists, there’s no living without them either. Pinned. Lauren — LET’S DO IT. Oh coffee, how I miss thee! And wine but that’s another story! These twists are beautiful! I soooo snacked on those honey twisty pretzels in college too! Subway and pretzel twists pretty much were all I ate! I’m down with your new diet of pretzels, coffee and ice cream. All we need is a snazzy hashtag and I think it will catch on like wild fire! These pretzels = da bomb! I’m a new baker to bread, I’m a little confused as to why the yeast is added if there’s no rise time? May — That’s an excellent question! The yeast helps to develop the texture of the bread, so even without a rise time it’s a necessary ingredient.